A moment of celebration for the 200,000th view of Wig Wags that occurred sometime today. Many thanks to those who have stopped by. OH and thanks to Gabriel Pollard for the photo. WordPress has recently partnered with PicApp.com to provide photos for embedding in blogs they host. I’m giving the new service a try in this post. All photos are fully licensed for use and searchable because of tagging. You, the reader, can close the thumbnails strip along the bottom of the photo or use it to locate similar pictures. You can also easily copy the code to embed the photos I’ve posted yourself. I’d be interested in your feedback on whether my blog loads any slower since these are being pulled from a different source. The photo below is of Federal soldiers outside a “bombproof” at Fort Burnham (the former Confederate Fort Harrison), near Richmond, Virginia. The fort fell to Union forces on September 29, 1864. The photo below was taken during the burial of the crew of the C.S.S. Hunley, April 17, 2004 in Charleston, South Carolina. I’m pleased to add two sites to my blogroll. First The Tipsy Historian which you can access here. I’ve enjoyed reading it for the first time today, particularly the post on the Lost Cause Mythology. And secondly, a fellow student blog called History Rhymes here which is blogged by Alex Seifert, a history student at the University of Wyoming. 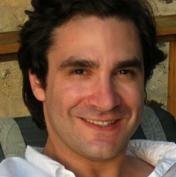 His focus is postbellum 19th century American History. Alex Rose’s blogroll over at The History Man pointed me in Alex’s direction so merci beaucoup Mr. Rose. This month marks my first full year of blogging on Wig Wags. To honor the occasion, I thought I’d trial a new look and a lighter background. It’s different, a little easier on the eyes but the photos don’t quite pop as much. And, limitations of the template have caused me to lose my picture header. I miss it. If I can figure out how to mess with CSS a bit, I may be able to reinstate it. I’m a firm believer that change is good but I also know the value of familiarity and complete changes in look can be risky. I’d be interested in any thoughts you – my readers – might have. Thanks to all of you who find your way the Wig Wags from time to time. I’ve appreciated the kind comments along the way and some terrific discussion. Alex Rose, who I mentioned in a post here and added to my blogroll recently, has a superbly entertaining post on writing history here on his new blog. Looking forward to the next installment. Source: shamelessly copied and cropped from his publicity website. While I’m shamelessly lifting items from his blog, ahem, I also am porting into my links a terrific site in his blogroll titled Reviews in History. Quite interesting and worth a look-see. One of the very cool things about blogging is being able to see the sites from which some readers come (referrers as WordPress calls them). Tonight I saw for the first time a referral from a Google’s translation page. I clicked on the page and it appears that I have had a Greek reader checking out the courses page which describes my program! Here’s a screen print. 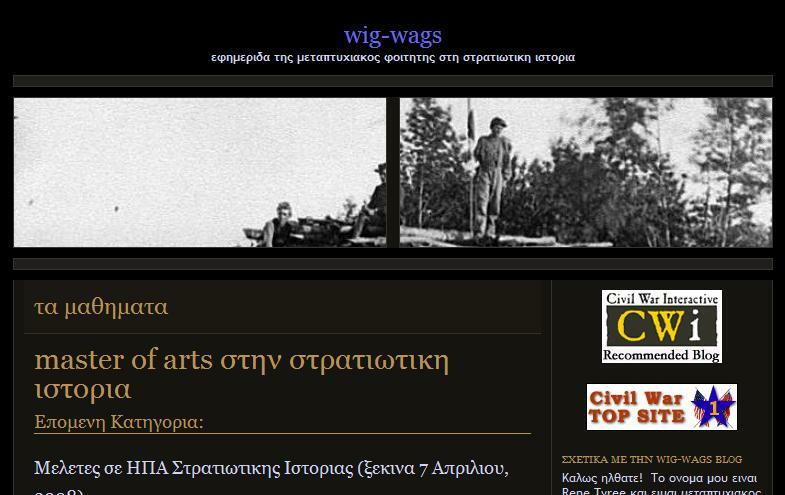 Check it out…wig-wags in Greek! Made my day.